﻿I love this cute card set. The card box and owl are so cute! I love the colors, too! 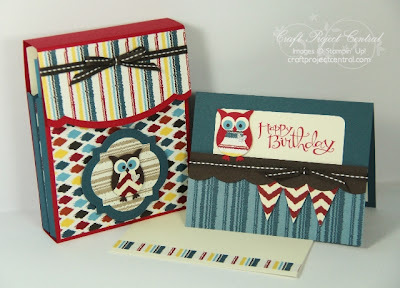 This great card set is another Craft Project Central project, and and it was made by Amanda Corbet. You can see more of her beautiful creations on her blog, Krafting Kreations. Do you have a friend(s) that loves owls or need a fun and funky gift set in a hurry? This Owl Box with six different card designs and matching envelopes is bright enough to cheer up anyone’s day! Make it for yourself or as a fun gift. If you would like to learn how to make this project, you'll want to subscribe for the month of April. With your subscription, you'll get illustrated, step-by-step instructions for 10 wonderful projects for only $10! You can find out how to gain access to a bonus eleventh project over at Craft Project Central. Please leave a comment for Amanda to let her know how great her project is, too!